Before texting was invented TW3 existed – “That was the Week that Was” – named after a TV satirical comedy/news programme. SO the TW3 week kicked off with a Monday afternoon Local Committee(Reigate) and then an evening one (Epsom) , getting home at 11.00pm – I was there to explain /promote our running of the SCC Small Grants programme (see website). A big effort, but necessary. Then on Tuesday morning it was our Management and Finance Trustees, with our external auditor reviewing the Annual Report and Accounts (2012/13) which we are trying to complete earlier this year. We are producing a separate Impact report too. We discussed a possible new Chairman, and also whether, as we have failed to recruit a Youth Work Adviser (after 2 ads) we should further morph the post into something more akin to a workforce development and HR post, and I think we will – especially after Wednesday’s discussion. The afternoon was at County Hall with my Chairman, the independent Chair of The Youth Consortium, and SCC’s Assistant Director for Young People - a private meeting – but I can only observe that it was very positive, indeed exciting. This was followed on Wednesday by another great session – the second of our Big Assist workshops, at which we concluded that there is scope for the “voluntary youth sector family” to develop more bilateral offers “within the family” (payroll, web design, mentoring etc etc) AND , more interestingly a shared multi-lateral approach to three services “within the family”: property facilities management, HR, and training and development. We also discussed the future of the chief executive role (much needed). So we have a very positive offer to make to our Trustees on 23 July. Whilst I would not claim that cost sharing , bulk purchasing or shared services are innovative, I do think that the total concept is a bold (and necessary ) one for the vol. youth sector. This was followed that evening by attending our sister organisation’s AGM in West Sussex- they are closing down- and we want to offer support to their members IF it is wanted, and IF our Trustees so agree. There is quite a lot of water to go under the bridge on this yet. So – home at 10.00pm. BUT a defining day. Thursday was an interesting Child and Adolescent mental Health Board ..amazingly 6% of all 0-16 year olds will experience bereavement, and a great presentation by CAHMS Young Advisers. SCC is re-commissioning mental health services that are co-funded by NHS (CCGs and SCC). And this (Friday) evening is a gentle evening in the Bishop of Guildford’s summer garden marquee event for the voluntary sector organisations of which he is Patron, including us. Next week is a (much deserved?) HOLIDAY! (so no blogs for a while). We signed off an agreement with Surrey County Council last Friday lunchtime whereby we have undertaken to administer the SCC Youth Small Grants Scheme for them . The grant scheme is a pot of £220,000 that is available for small organisations (like sports clubs, scouts, guides etc ) that have a turnover of less than £100,000 and are NOT contracted to deliver youth work to SCC . Grants are available for between £500 and £5,000 max. Details are on our website. SO having signed on Friday , we were open for business with the Small Grants scheme on Tuesday morning! Fast track implementation! Kate Peters and I are visiting nearly every Local Committee of Surrey CC (ie 11) and went to the Mole Valley one on Wednesday. (In a former life I co - wrote the original terms of reference for SCC’s Local C’tees, and have been to all 11 Committees many times). A sense of deja vu crept over me in the Pipprook Council Chamber….the cost of democracy as petitions were heard and good citizens pleaded for parking restrictions and so on. LOTS of process..little product. Why aren’t issues resolved by talking to local people at ground level earlier? We are very busy with our new website due to be launched next week, with a much more contemporary look and feel. Met with YES+ yesterday, being an organisation that works with young offenders, using reformed, trained, ex criminals as the facilitators doing the work. Point of meeting was to start building a grant bid for the Consortium to train up voluntary sector youth workers in identifying/assisting young people at risk, and then to work with those young people directly in one specific borough – probably Spelthorne. Very encouraging. Also met with someone who is keen to come and work with us, and a possible new Chairman to succeed David Hypher. Lots of possibilities. Grandchildren staying with us tonight and Saturday night (aged 5 and 3) so back to work for a rest next Monday! Enjoy the rugby on Saturday evening- great first half against Argentina last week – my man is Kvesic(7) ..makes all the difference to the team…to have…… a bridgebuilder/connector. It’s been a great week!! Meeting at Canary Wharf on Wednesday with a national bank to finalise their sponsorship of COMMUNILAB, being the virtual learning network that will bring together community - university- local authority and business perspectives. The meeting was very positive, indeed serendipitous as one of the bank’s participants lives down the road in Burpham, thereby exemplifying our point exactly that COMMUNILAB enables employers to demonstrate support for their employees in their home context. Indebted to our Trustee Nigel Biggs whose idea this is – great generosity of spirit. Very useful strategic discussion on Monday with the Assistant CEO of Surrey & Borders NHS Trust about the Consortium bid for grant-making trust funding to train voluntary sector youth workers in how to identify and respond appropriately to mental health issues amongst young people. Really promising long term links established. Surrey Police Crime Commissioner has indeed become a Partner organisation of ours and we welcome them. The Surrey CC local prevention grants are being made – the £2.5mill - and I met with a very angry and frustrated bidder on Tuesday to hear his views, which was useful as yesterday I had a one to one meeting with Surrey CC’s top manger for services to young people, which is my most private discussion I’m afraid. 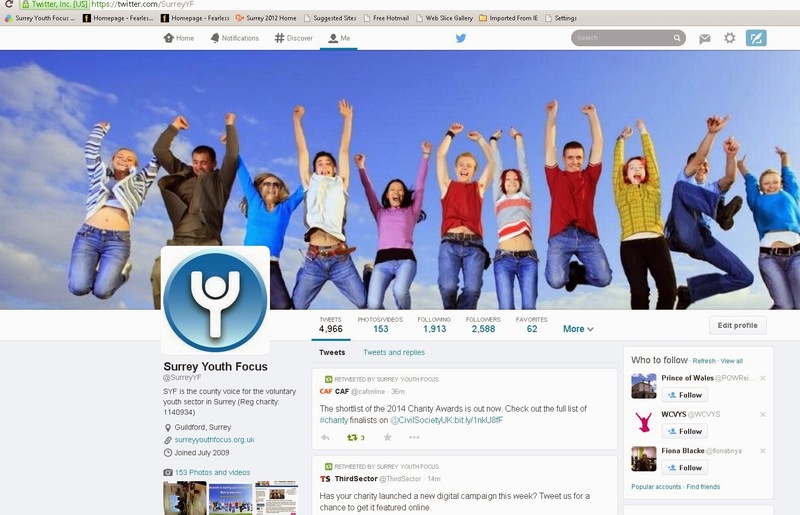 All good for Surrey Youth Focus though. Signing off our agreement with Business in the Community today whereby we undertake to help them source volunteering opportunities/corporate awayday projects amongst our members in return for a fee. Off today to meet with my fellow directors of the social enterprise now that we have our office base in Leatherhead; we need to progress matters quickly now to recruit staff and get trading. Then meeting with Surrey CC commissioner to sign contract for us to undertake the admin of their Youth Small Grants scheme (£200,000) in respect of which we have been cranking up by….Recruiting Su Freeman as our Events and Marketing Manger so that Kate has the time to organise the small grants scheme, for which of course we get a fee. Delighted that Su has joined us – her background is in sports marketing/events organising, but sorry that Shelagh West has decided to discontinue her volunteering with us as business adviser and we wish her well, especially with controlling her new puppy – a full time occupation! And finally – don’t forget Argentina v. England on Sat evening (BBC 2) . If you have to ask, you can’t be a regular reader. Gearing up for 2015!